uuid : db4d6167-b85f-472a-8d4a-89f7e758e328 templates_id: 119469 templates_uuid: "ad8e44ba-c21d-45f1-bdea-3e8ff6837eb8" title: "Sales Agency Agreement - Sales Agency Contract Template" display_name: "Sales agency agreement" meta_keywords: "Sales agency contract, exclusivity contract and exclusivity agreement" description: "
Protect yourself when appointing an agent to sell your products or when you are being appointed as a sales agent with this sales agency agreement. 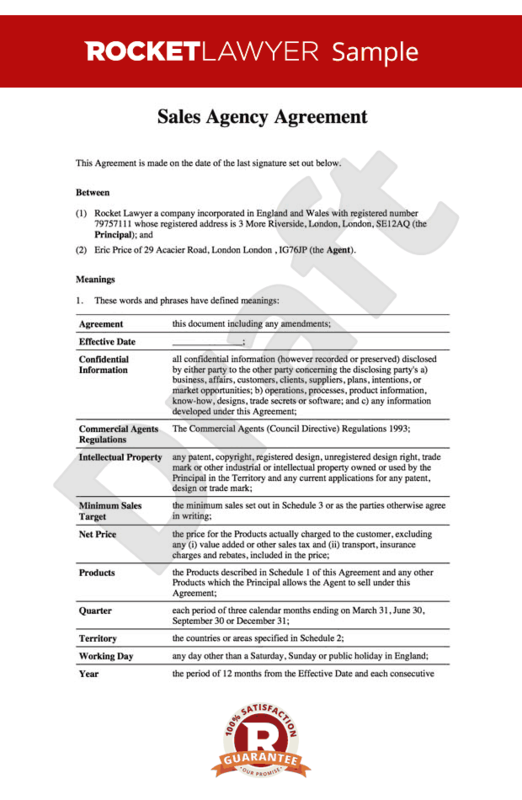 Use this agreement to appoint an agent on an exclusive or non-exclusive basis. This straightforward sales agency contract contains everything needed to protect a principal with product to sell as well as the appointed sales agent, ensuring that both comply with the law. It covers the basis of appointment, the geographical areas, or territory, duties of the principal and agent, minimum sales targets, commission and how to end the agency agreement. to appoint an agent to sell your products in a defined geographical area, or territory, on an exclusive or non-exclusive basis. A sales agency agreement is a document that appoints a sales agent to negotiate and enter into a contract of sale on a principal\302\222s (supplier\302\222s) behalf. It sets out the basis of appointment of the agent, duties of principal and agent, minimum sale targets, commission amount and the processes for payment and ending the agreement. When do I need a sales agency agreement? You need a sales agency agreement when you want to appoint an agent to sell your products in a defined geographical area, territory or on exclusive or nonexclusive basis. What is the difference between a distributor and a sales agent? An agent is someone who acts on supplier\302\222s behalf. Although an agent may arrange sales, the sales contract will be between the supplier and the end customer, i.e. an end user of the product. distributor is a supplier\302\222s customer. The distributor sells the product to their own customers. What is the difference between exclusive and non-exclusive agent? Exclusive agency gives an agent exclusive rights to sell principal\302\222s products in the territory and the principal agrees not to appoint other agents in the same territory. In a non-exclusive agency, the principal can appoint other agents in the territory and the agent will need to compete with others to promote and conclude sales. Normally, the territory will be defined as geographical area the agent is appointed to operate. What restrictions can a supplier place on an agent? A supplier can prevent an agent from selling competing products from another business in the set territory for the length of the agreement or for a time after the agreement ends. A supplier can also restrict the agent from exceeding an expenses limit in the specified period of time and may require an agent to provide a guarantee payment that protects the supplier in case a buyer fails to make a payment. Can you set a minimum sales target? Yes, in this agreement you can set minimum sales targets. What can a supplier do do if an agent does not meet this target? and/or remove or add products to the list of those that the agent is authorised to sell. You can also choose to end this agreement by giving the agent a written notice of termination. In this document you can specify the notice period. when either party is dissolved or is in risk of bankruptcy. This sales agency contract complies with the Commercial Agents (Council Directive) Regulations 1993 and is governed by the law of England and Wales.
" created_timestamp: "2018-10-08 04:36:10.0" modified_timestamp: "2018-10-08 04:36:10.0" active: true created_by: 157 modified_by: 157 dcm_id: 221 url_slug: "Sales-agency-agreement" meta_description: "Create a sales agency agreement with simple step-by-step guidance from Rocket Lawyer. Protect yourself when appointing an agent to sell your products with this sales agency contract. Try this free sales agency agreement." time_to_complete: "25 minutes" role1: "Principal" role2: "Agent"
A sales agency agreement is a document that appoints a sales agent to negotiate and enter into a contract of sale on a principals (suppliers) behalf. It sets out the basis of appointment of the agent, duties of principal and agent, minimum sale targets, commission amount and the processes for payment and ending the agreement. An agent is someone who acts on suppliers behalf. Although an agent may arrange sales, the sales contract will be between the supplier and the end customer, i.e. an end user of the product. distributor is a suppliers customer. The distributor sells the product to their own customers. Exclusive agency gives an agent exclusive rights to sell principals products in the territory and the principal agrees not to appoint other agents in the same territory. In a non-exclusive agency, the principal can appoint other agents in the territory and the agent will need to compete with others to promote and conclude sales. Normally, the territory will be defined as geographical area the agent is appointed to operate. More than just a Sales agency agreement template, our step-by-step interview and guidance makes it easy to create your document. Easily create online, download, print and sign your free Sales agency agreement in minutes. This document is also sometimes called: Sales agency contract, exclusivity contract and exclusivity agreement.